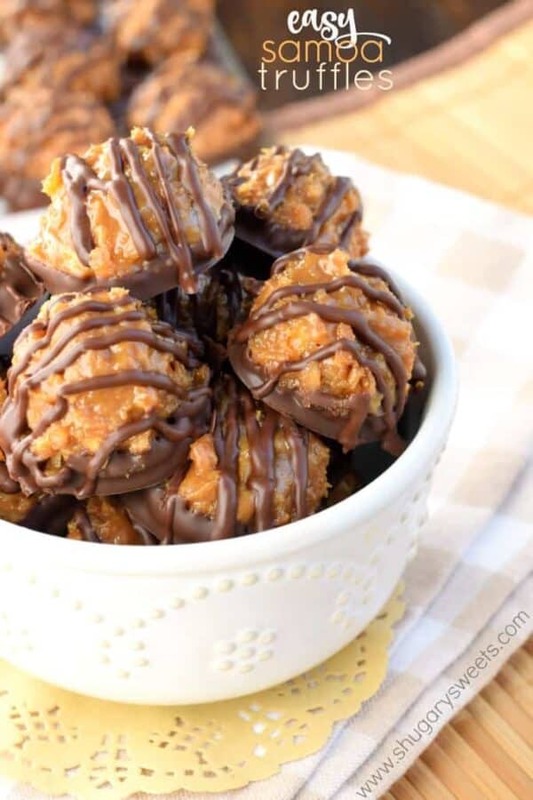 If you love Caramel deLites or Samoa Girl Scout Cookies, then these easy Samoa Truffles are going to drive your taste buds crazy! Raise your hand if you LOVE Girl Scout Cookies. Through the years I’ve been slightly obsessed. And each member of my family has a favorite flavor. Mine, obviously, is the box of Samoas. I think now they are called Caramel deLites (or maybe it’s by region?). Anyway, I love to stock up and keep a box in my freezer. And normally, between me and my husband we tend to overbuy. Each of us saying yes independently to any girl who asks. And let’s not forget the girls at the grocery store every weekend…I’ve fallen for that trap too! Did you know that you can now DONATE your boxes to US troops? So that’s the option I’ve been choosing every time I’m asked this year. But then I panicked. The thought of ZERO boxes of Samoas in my freezer, for you know, the sweet tooth emergencies, it scared me. 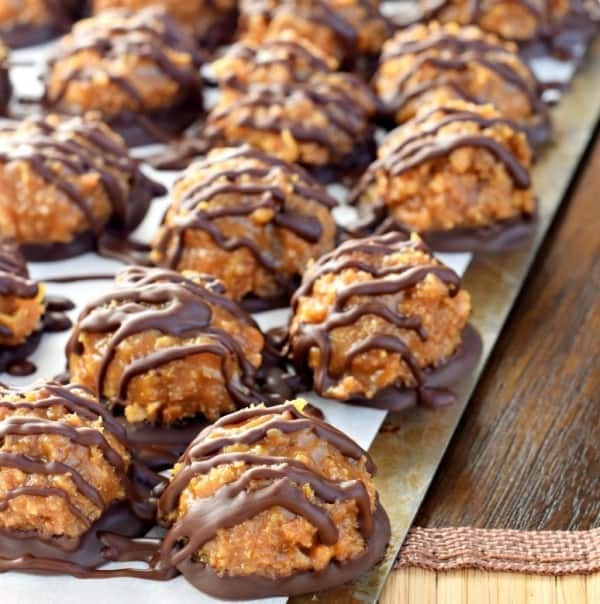 That’s where these Samoa Truffles came into play. A sweet, delicious truffle packed with the best parts of my favorite cookie, in an easy to eat truffle. And….these can be stored in the freezer. Perfect, right? So moral of today’s story. Buy some Girl Scout Cookies (it’s the right thing to do!) and donate them to our troops (an even better thing to do!). 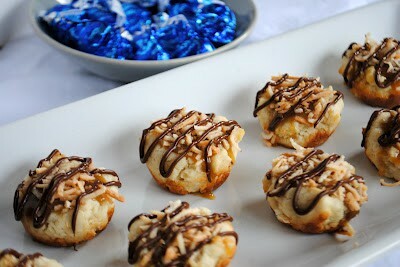 Then whip up a batch of these Samoa Truffles and you’ll feel happy that I made this decision for you! On a large baking sheet, spread coconut into a single layer. Bake in a 350 degree oven for 10-15 minutes, until lightly browned. Be sure to turn and flip the coconut every 5 minutes. Remove from oven. In a bowl, combine coconut, dulce de leche, sweetened condensed milk and cookie crumbs. Stir until well combined. Line a baking sheet with parchment paper. Scoop one tablespoon of mixture (I use this scoop) onto the parchment paper. Repeat until all mixture is used. Place baking sheet in freezer and freeze for about 30 minutes. Melt chocolate wafers according to package directions (about 1 1/2 minutes in microwave, stirring every 30 seconds). Dip bottom of each truffle in melted chocolate and return to parchment paper. Once all truffles are dipped, put the remaining chocolate into a small ziploc bag. Snip off the corner and drizzle over truffles. Store in refrigerator (or freezer) in airtight container. **Make sure you are using 1 can of dulce de leche (the thick caramel). Many people who have had issues with this spreading are not using the right can. You can see the correct product here! 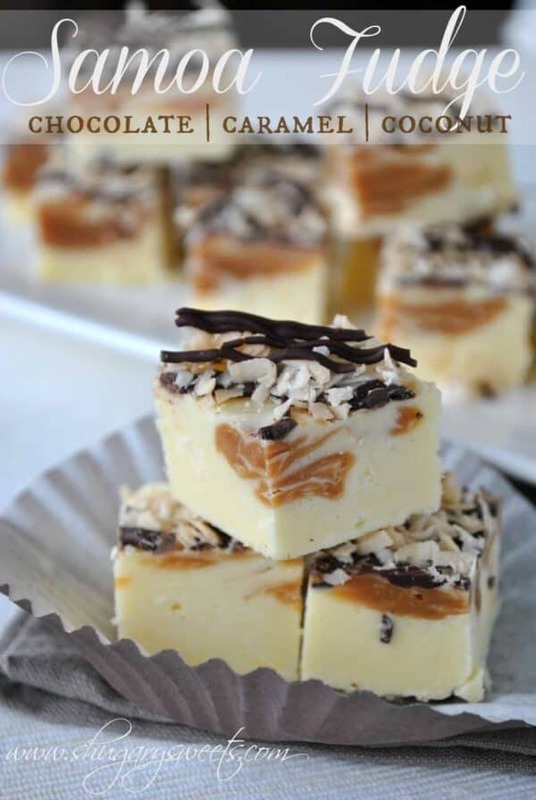 Samoa Fudge: this creamy fudge packed with coconut, caramel and chocolate is a take on the classic cookie! Samoa Cookie Cups: delicious shortbread cookie cup with a surprise center! 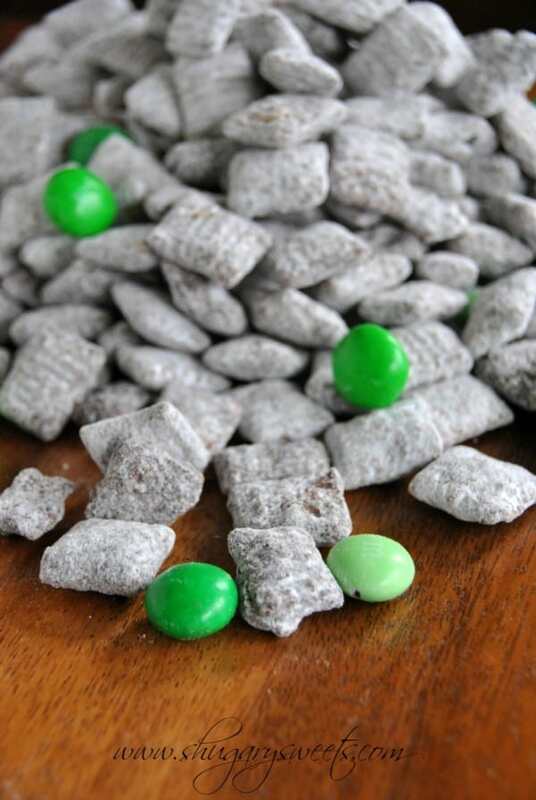 Thin Mint Puppy Chow: no actual cookies are used to make this muddy buddy treat! I will do my duty for America and buy lots of GS cookies. People like your son are the real heroes, but you are also doing such goodness by sending those packages out there! Can’t wait to get my boxes. In the meantime, these truffles will hold me over! Dare I say I’d probably (absolutely!) like these more than their cookie counterpart!? Such a great idea and they’re so cute! These make me hungry for something sweet! Awww, man! They look so incredible and they Samoa/Caramel DeLite is my favorite cookie. I have a case (yes, a case) sitting on my dining room table right now. The texture and color and just everything about these looks TOTALLY authentic! Wow, you really outdid yourself! Now I want them all because I love Samoas!!! Um these photos are gorgeous. They speak to me! In chocolate, lol my favorite language! Samoas are the best! I can’t wait to try these! The Samoa doesn’t last long in our house! It’s everyone’s favorite GS cookie, so I’m sure these little truffle bites would be a huge hit! Okay, so like you, Samoas are absolutely my favorite GS cookie!! This is the first year that I’ve donated my cookies to the Troops. Great idea, but I gotta say, I’m missing those treats (although I’m holding my ground and not buy myself any!). Your truffles? To die for! When I saw your beautiful photos, I flipped! Can’t wait to try these (all year!). Awesome! Thanks for donating your boxes to our troops too! 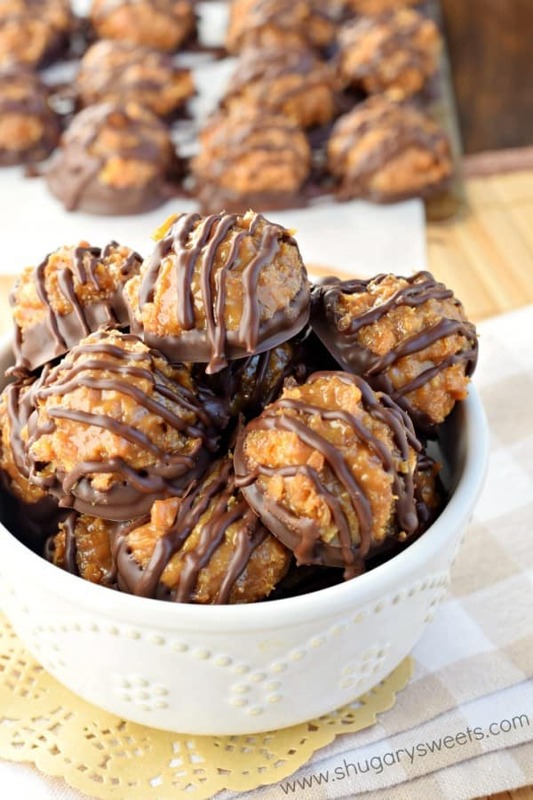 Such a great idea those Girl Scouts had 🙂 That said, these Samoa Truffles are a way to pat yourself on the back, haha! Oh my gosh, what?! These truffles are killing me. I have to have it! Looks very delicious. I’ll try to make it when i go home. Beautiful and tasty recipe. Good choice Amiee! LOL. They are pretty darn delicious. 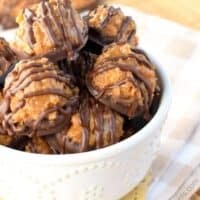 These look so good, I love samoa cookies so much I make them all the time I will have to try making your ruffle version for sure! Somehow, I completely missed out on buying ANY Girl Scout cookies last year! It was a sad, Samoa-less spring. These truffles look even better than the cookies, though, so whatever happens this year, I’ll be covered! 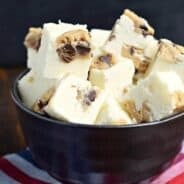 Forget those little green boxes…I need a freezer full of these awesome bites!!! Love these fun truffles! These are my favorite girl scout cookies! Great recipe! These look absolutely yummy.. In my area, we don’t have what you called “can dulce de leche”.. am sure it is some sort of milk, but we don’t have it here. Any substitute? All of these look heavenly delicious… I have a soft spot for caramel and cannot help trying to make these at home. Thanks for the recipe! I made these yesterday, and while they taste really good, I think my consistency is off. Even after being in the freezer all night, they are very soft. When I first scooped them out, they flowed into a flatish disk instead of staying in little mounds. Have you run into that problem, and do you have any suggestions to firm up the consistency? I made these today and, like Geri, the consistency was off. I added what was left of the vanilla wafers, maybe 1/2 cup ( I had eaten a bunch on the way home from the store) and added maybe another cup of coconut. They held their shape but are still soft and a little sticky. Were they supposed to be baked at all? So a can of caramel AND a can of S.C. Milk? I am excited to make these for my coworkers tonight, just want to make sure I buy the right thing. Ive heard of people making caramel by boiling a can of SCMilk, so it seemed interesting to have double creamy sweetness. I need these sooooo much right now! I used dulce de leche just like the recipe stated. I double and triple checked the recipe and my ingredients and it just didn’t work out for me. It tasted very good, but was not a consistency that would hold a truffle shape unless completely frozen. I might try the recipe again with more cookie crumbs and dipping them completely in chocolate. I made these tonight and fell in love. But I did so something a bit different. I toasted an additional 7oz of coconut and rolled the truffle in the toasted coconut. Then I dipped the bottom in chocolate and drizzled some on top. I love that look of the toasted coconut on the outside. I tried this recipe and they are still completely gooey. Could I have crumbled the cookies to much? Ohmygoodness! These are amazing! They were a bit “gooey” but who cares once you taste it and it melts in your mouth…. Wowzers. Hubby says it’s the best thing he ever ate. I might try not crumbling the vanilla wafers as much to add a bit of that crunch I like in the Samoa cookies but have no problems making (eating) them the way the recipe instructs. I want to try some other things listed to help it not be as gooey just for the sake of messiness when eating but it was definitely not a put off! Super amazing recipe – Thanks so much! I made these tonight and had the same problems as everyone else. The “batter” did not have the consistency to stay in mounds and was gooey. They have been in the feeezer for several hours and are still very sticky and are more like flat cookies. I’m sure they taste amazing and that’s not the issue but I was doing a test batch for a cookie day event and thought these would turn out like the picture and hold their shape. I will try and play around with adding more cookies and coconut like the others. I had the same issue with the “goeyness”. Maybe I should have added more cookie crumbs? They were very sticky and may be difficult to eat without getting messy fingers. I am hoping when the chocolate sets up, they will be more manageable. I like the above idea of adding the toast coconut on the outside before dipping! Hmmm, mine also came out flat…more cookies needed? I should try these very soon! dulce de leche and NOT caramel sauce. Did anyone come up with a solution for them? I seriously just made them this week and can’t figure out why so many people are having trouble. I know many who have made it without issues…so so odd 🙁 I purposefully made them again just to double check ingredients, etc. Worked perfectly. I just made these and they turned out perfect. I think an issue people might be having is with the cookies. I bought a box of bills wafer minis. The whole box was 11 oz but when measuring it was about 3.5 cups. I decided to use to whole box. I also put another cup or two on the side incase I needed more after mixing I didn’t need it. The 11 oz seemed perfect. The truffle held its shape as I was scooping. If it’s runny before you freeze it it’s not going to magically turn into a ball and be a truffle after freezing. I ran my cookies through a food processor. I’m not sure if crushing by hand or mixer would change the density enough to have variations in by the cup measurement. It might easier to go by the weight. Also I used a whole bag of coconut. I think this recipe is great and totally worth trying again for anyone who didn’t get it right. I would like to give this recipe a try. If I like them, I was planning on adding them to my Christmas cookie collection. My question is, do they HAVE to be refrigerated after made? I have some out of state recipients and want to make sure they will stay fresh enough during shipping. Thanks! I did go by weight for the cookies. I used a scale and weighed them out before crushing with a rolling pin in a plastic bag. To salvage the batch–too much invested at this point to toss it–I ended up adding half again as many cookies and rolled them in more toasted coconut before dipping in chocolate. They hold their shape just fine with the addition (would have held shape without the added coconut but it keeps them from being so sticky for using on a party table) and are very tasty for sure, but I would certainly not try them again if that had not worked. so far so good with the cookies. I only got around 40 not 72. I used a T scoop. Oh well!! Cant wait to try them! I made these and I cannot get them to hold there shape. I ended up making two batches. The first I added double the coconut, they still wouldn’t hold their shape. On the second batch I added double the coconut and an extra cup of the cookie crumble. They looked a little better, but I definitely won’t be using them at our annual cookie exchange this year. They looked so great in your photo, I wish I would have read the comments first as well. I hope others have better luck. Can anyone please tell me what to do if I can’t find canned dulce de leche? I have all the other ingredients and am dying to make these. I couldn’t find it either and I looked online and you can take a regular can of sweetened condensed milk and boil it in a pot of water (take the label off first) for 2 hours and let it cool before you open it up. It came out perfectly, but it was a long time to wait for it! Just made a batch and came out fine, not runny at all. I added the entire box of crushed cookies which was a bit over 2 cups. Also I crushed the cookies down to fine crumbs which probably helps hold the ingredients together better. Still in the freezer prepping for chocolate. Can’t wait to eat them! I have to say that even though I had to finagle a bit because they were way too runny after following the recipe to the letter, these are simply awesome. I did serve them at my party and they were received to rave reviews. Now that I know what I have to do to make them work, I probably will make them again–but not until next Christmas because I want to eat them all! I ended up adding half again as many cookies and rolled them in more toasted coconut before dipping in chocolate. They hold their shape just fine with the addition (would have held shape without the added coconut but it keeps them from being so sticky for using on a party table. I made these today and they turned out really well! They’re super tasty and easy to make. I will say that I will add more cookies or maybe nuts next time to make a little bit more texture–crunch. They set up well and taste like Carmel Delight cookies! I was lazy and dipped the whole truffle in chocolate verses the two-step prettiness photographed. I’m super excited for everyone to try them on Christmas! Your photos are what made me try this recipe! Well, the photos AND the fact that Samoas are my all-time favorite GS cookie. And although a couple of my truffles are flattening the rest kept their shape as they were scooped onto parchment paper. I had picked up a box of Mini Nilla wafers without realizing it, and was relieved to see it was the same weight. However, I did measure out about 2 cups of crumbs. Seeing that the batter looked too wet, I added more crumbs by handfuls at a time…I know, not the best method, but it worked…until the batter held together better. I knew if the batter held together as I stirred in more crumbs it would also hold as I scooped. The truffles are in the freezer now, and I’ve read some of the reviews while waiting. So I think I will toast the remaining coconut I have and roll the truffles in it before dipping in chocolate, just to take the chance of stickiness away when serving these. Thank you so very much for sharing this recipe! It really is quick and easy, which is what I look for around the holidays, as long as it also turns out as delicious as I know these will! I made these for xmas eve tomorrow and they came out wonderful!! Great recipe!!! My question is how long can they stay out of the refrigerator. I will arrive to my Aunts at 3pm and we probably won’t eat them until 9PM. Will they be okay out of the refrigerator all that time, you think? Yay! They do freeze well, in case you were wondering 🙂 Although, it doesn’t stop me from grabbing them straight from the freezer! I made these yesterday my family did like them but I think next time I’m going to use shortbread cookies instead of the vanilla wafers. I made these for a cookie swap and by far had the best cookies! Everyone loved them! Mine had to be a little bigger as I didnt have a small enough scooper but no one seemed to mind! I am just finishing making these for the 2nd time. They got an A++ from first batch. I did not have any problem with them not setting up, just the opposite. I rolled them into balls, and they stayed balls, this time I am going to push them down a bit so the base is flat, and they won’t roll around! It is winter, and I keep my house between 58 and 60 degrees. Room temperature varies from home to home, season to season, I wonder if the people having problems would just cool the mixture down before shaping? I warmed up the Dulce de leche because it so thick this time, made it easier to get out of the can-mixture is cooling down as I write! All that have tried them, loved them! PS, I roll mine in extra toasted coconut-because I LIKE IT! I made these and they turned out perfect! Quick easy and delishous! We even past them out to our neighbors! I’m making another batch now! I made these yesterday and took to a birthday party. They turned out perfect and were a hit! Super easy and quick to make. I made 70 in about 1hr 15min. Definitely a keeper. Thanks! One point: cool coconut completely before adding to milks. Maybe that’s a reason why some are having issues with the the mix being too thin? Also, remember this is a CONFECTION not a cookie, so it will be slightly tacky to the touch but not bad at all. Yum! Made these tonight and they came out phenomenal. Not sure why so many had runny truffles. My batter was so thick my hand was tired of mixing. I made it exactly as written. I did like the idea of rolling them in toasted coconuts before dipping in chocolate so I did that. 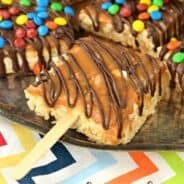 A+ First recipe used from Shugary Sweets and I am impressed! Thank you. I’m almost thinking some people might be using caramel sauce instead of dulce de leche (which is much thicker)! Glad you enjoyed them! Made these last night and they came out great! Thanks for sharing the recipe! They were a hit! I was worried about the consistency after reading so many of the comments but it worked perfect! I used the Nestle brand Dulce you recommended and the entire 11oz box of nilla wafers. I think people were maybe trying to crush the cookies and measure them out instead of crushing the entire box and using the whole thing. I used the dolci frutta chocolate wafers instead of Ghiradelli since thats what I had at home and it worked! Thanks again!!! 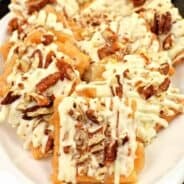 I have made these twice now and what a hit! People are ga ga over them. Recipe was easy and turned out perfectly. I suggest these for any occasion and people will think you are a superstar! Thanks so much! Quick question: I want to take these in for a work party, but they won’t be stored in a fridge. Do you think they will be too soft left at room temp? I saw they should be stored in the fridge, but wasn’t sure if they would be okay left out too. Thanks! I’ve left them out for a party and they were totally fine. I usually store mine in the freezer, and that way the stay chilled longer at room temperature! Made these last night. After reading the comments I used the whole box of Nilla Wafers, and all of the dulce de Leche, and not quite all of the sweetened condensed milk so that the mixture was the right consistence. I was not really able to scoop the mixture as it was quite sticky so I just rolled it into balls. The truffles came out fine and look just like the photo. I am currently making these, and the consistent is perfect! I went with the recommendation of getting the specific can of Dulce De Leche, in the Mexican isle at Albertsons. I got the condensed milk right next as well. A couple things, I added more coconut. I felt 7oz wasn’t enough. I almost doubled it. And using a 2inch scooper has produced about 53 balls. So a smaller scouper would produce more truffles. Followed the recipe to a T and they were delicious! I made them to bring somewhere but my Facebook got to them first. Gone in 2 days. Making a double batch now! I also used food processor for cookies and measured 2 cups out after they were crumbs. Thanks for awesome and easy recipe! Do they “have” to be refrigerated? I would like to use them in my cookie swap at school, but they will be stored in my classroom until the end of the day. Thanks. Nope, you can leave them out. Followed the recipe to a T and they came out perfect. Not sure how these could be runny, the leche is so thick that by the time I was done combining all the ingredients my arm was ready to fall off! I made these using boiled condensed milk and they were fine. I’ve done it twice. The first time I cooked the milk in the can for hour hours On the stovetop, the second time I used my instant pot and cooked it for 40 minutes on high and then did quick release. If you use condensed milk to make your Dulce de Leche, you need to really cook it to get it think. My truffles settled a bit and were sticky, but after I dipped the bottoms in chocolate and drizzled the tops, they firmed up. If you can’t find canned Dulce de Leche, just cook your condensed milk longer. Four hours, not hour hours! Just made these tonight and they came out great! Followed the recipe exactly as stated and didn’t have any problems! Theyre def sticky but once I dipped & drizzled in chocolate they set up perfectly! Chilling in the freezer now! 😉 thanks for sharing! So glad to hear it 🙂 They’re so wonderful! I’m torn on these. I was a little concerned by all the comments expressing problems, so I figured I would dip them entirely in chocolate to eliminate the stickiness issue. But then the chocolate overpowers the other flavors. It threw off the flavor ratio too much. But I’d be concerned about not dipping them completely, because they are *incredibly* sticky. I can’t imagine wanting to pick one up with my fingers if they weren’t covered in chocolate and truffles are finger food by default. The caramel/Nilla wafer/coconut flavor pre-chocolate was good, but it’s drowned out when the chocolate is added. I didn’t have the consistency issues that people report, though. I bought the canned dulce de leche (they sell it at the Walmart supercenter near me as well as few other grocery stores) so no issues there. (Guys, the correct dulce is so thick that it doesn’t pour out of the can. You have to scoop it. It’s not like caramel for ice cream. Also, make sure you cool your toasted coconut, otherwise the heat will melt the dulce, which could be causing the spreading.) So.. I didn’t have the disaster issues with spreading that people had, but I’m not sure if I would do these again. The flavor of the interior is good, but it’s just so sticky I don’t think I’d want it without a chocolate coating.. but the chocolate coating is too much chocolate for the other flavors to really come through. They’re fine, but not what I’d call amazing.